Catechesis of the Good Shepherd will be offered at St. Michael’s Church on Tuesday morning from 9:00 to 10:30 am beginning September 11, 2018. This Montessori-based program allows even the youngest child to work in an environment that fits their potential, while they come to know God and fall in love with Him. Children are capable of understanding the great mysteries of our faith and become active members of the Church. Children in the Level 1 (ages 3-6) program spend time enjoying and nurturing a relationship with the Good Shepherd. The children are deeply affected by the boundless love of the shepherd for His sheep as described in the Scriptures. They learn that He knows His sheep, calls them by name, searches for a lost sheep, and celebrates the found sheep. Materials and presentations on the life of Christ and His teachings help to make the great mystery of who God is more understandable for the child. Through geography, the words of the prophets, and infancy narratives, Jesus is established as a real person. The Paschal narratives are treated similarly, using model cities of Jerusalem, empty tombs, and cenacles for the Last Supper. Selected parables further the child’s wonder and curiosity about the great mystery of the Kingdom of God. Children become familiar with the articles of the Eucharist and Baptism by arranging them in their own atrium on miniature altars and fonts. The children also become acquainted with the gestures of our liturgy and their meaning of the Paschal Mystery: Christ has died, Christ has risen and Christ will come again. A prayer corner located in each atrium reflects the liturgical time of year by means of appropriate colors, prayer, songs, artwork and readings. We believe in Catechesis of the Good Shepherd. We believe it is an excellent method for the formation and education of our children. It is rooted in the Bible, the liturgy of the church, and the educational principles of Maria Montessori. Children gather in an “atrium” a room prepared for them, which contains simple yet beautiful materials that they use. We believe that God and the child have a unique relationship with one another particularly before the age of six and that the growth of this relationship should be guided by the adult, but is directed by the Spirit of God within the child. Children need their own place to foster the growth of that relationship. Cost of the program is $25.00. Registration forms and schedule are available in the parish office. If you are interested in the program or have questions, please give us a call at 320-251-6923. 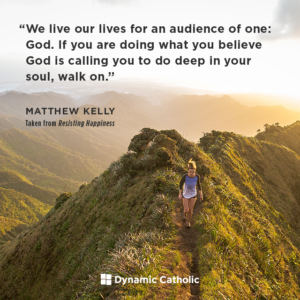 Go to Dynamic Catholic.com and sign up to receive daily emails with short inspirational quotes to begin your morning on a great journey with God. All you have to do is sign up at Dynamic Catholic.com today!